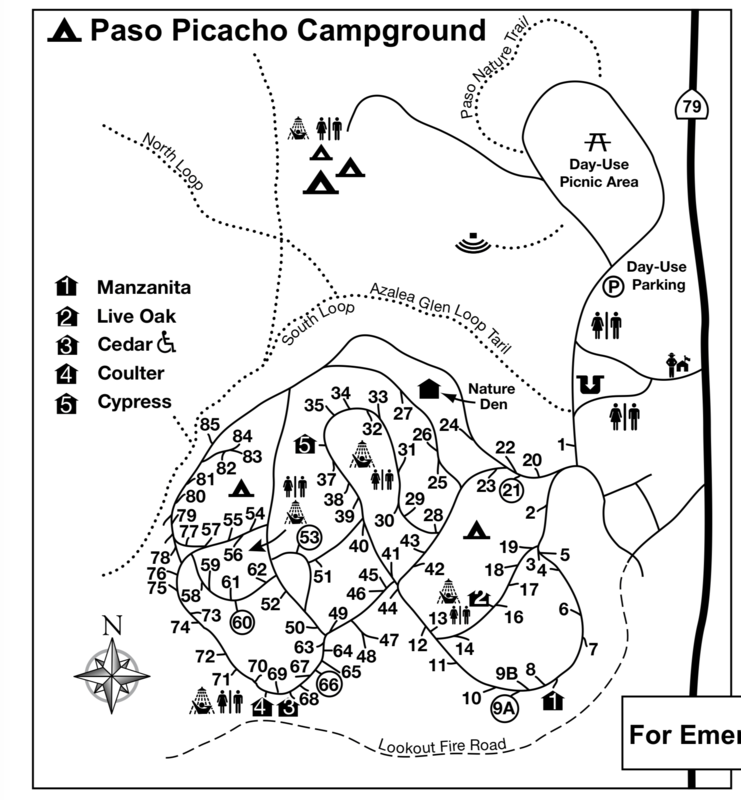 Paso Picacho Campground at Cuyamaca Rancho State Park has 85 campsites, 5 cabins (with beds, stove and light) and one (tent-only / walk-in) group campsite. Cabins cost $75 per night plus taxes and reservation fee. The campground is located in a nice forest of conifers. It is rather spread out with most campsites having some nice privacy. Campsites can accommodate tents, trailers and RVs (up to 30 feet). There is a limit of 8 people per single-family campsite. Each campsite also has a table and fire ring/grill. There are no hookups at this campground. There is also one group (tent, walk-in) camping area accessed from the day-use picnic area, and also a group equestrian campsite. Paso Piacho Campground has a dump station, drinking water, flush toilets and hot showers. Firewood is available for sale at the campground. Check-in time is 2:00 PM and check-out is 12:00 PM. Reservations are necessary for weekends April through October. The camping fee includes one motorized vehicle. Cuyamaca Rancho State Park is a beautiful and popular park and includes miles of hiking, biking and equestrian trails. In edition, Lake Cuyamaca offers boating and fishing. Other outdoor activities include picnicking, photography, wildlife viewing, horseback riding and swimming in some of the creek’s ‘swimming holes’. Green Valley campground is also in Cuyamaca Rancho State Park. It has 58 campsites for tents, trailers and RVs, as well as 15 equestrian campsites. Visted Paso Picacho Campground lately? We'd love to hear about your adventure. Did you find us useful? Did we forget something? Anything our community should know before heading out to Paso Picacho? Its so beautiful there. We are on our way there right now and cant wait. Cooler temps, beautiful scenery. I saw deer in the wild for the first time last time we were there. What time is the earliest we can enter the campgrounds? Our group will already be on-site Friday, but due to work obligations, we can’t arrive until early Saturday morning. We will be staying at site 6, 7, and 8. Paso Picacho campground check-in time is 2:00 PM and check-out is 12:00 PM. The camping fee includes one motorized vehicles (extras are $10 per night). There is an 8 person limit per campsites. Pets/dogs are allowed on leash. What is the latest time we can arrive Friday night? We have campsite PO20 and have a 29 foot trailer we have to park. Will it be to tight to park it at night? Your 29-foot trailer should be fine to park in site PO20. Is there a ranger onsite Saturdays? I ask as campsites are all booked (except for the ADA sites) and wondering if there is a possibility of reserving day of (drive in/walk in)? 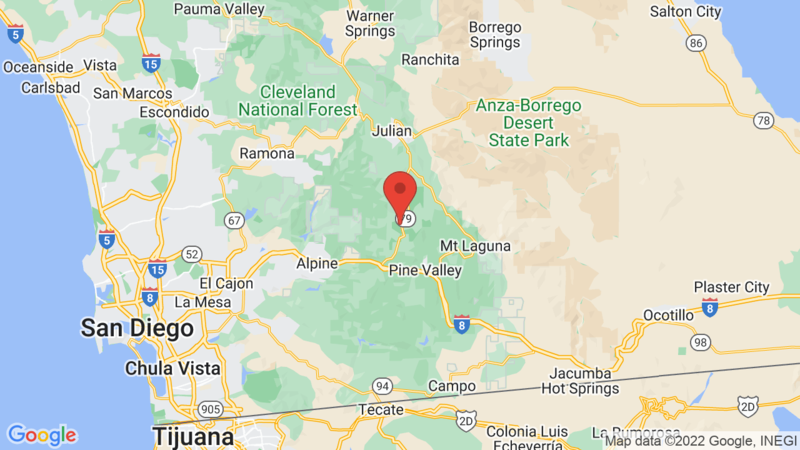 We will be up in Cuyamaca hiking anyway, so is there a possibility for a day of drop in reservation on a Saturday… maybe there is a cancellation? Yes a ranger is usually on duty at Paso Picacho campground on Saturdays. Can you tell me how much the cabins are at Paso Picacho campground and if they are also first-come, first-serve basis? They will be able to provide pricing and availability. Are there hook ups for RV’s at the campsite? There are no hookups at Paso Picacho campground. Is there a filling station to fill the water tank in our camper? Is there electricity in the cabins? Thank you in advance! The Paso Picacho cabins at Cuyamaca Rancho State Park have a ceiling light, beds and a stove. We’re not sure if they have electric plugs. You might try calling the park directly at 7670-765-3020. Can we take our dog on the trails at Paso Picacho on a leash? Pets/dogs are allowed (on leash) in the campground, as well as on the Los Caballos/Stonewall Mine Road trails and the the paved Cuyamaca Peak Fire Road. Bicycles and horseback riders are also allowed on these trails. Dogs are not allowed on any other trails in the Cuyamaca Rancho State Park. Unfortunately we don’t have photos of the Paso Picacho cabins and can’t help you with trying to identify which code/# is assigned to the Cedar Cabin. I’ll schedule a photographer to get up there soon and photograph the cabins, but it probably won’t be until a month or so. Are there any restrictions for having campfires this weekend? Stayed there a few days ago mid week. Had entire campground mostly to ourselves. It was wonderful. We had walked by the locked cabins but I failed to inquire while there how much they cost and if they were available in the winter. The official website for Paso Picacho does not provide any cabin information. Can we just show up this time of year and get one first come first served? Cabins at Paso Picacho campground in Cuyamaca Rancho State Park cost $75 per night + an $8 per night reservation charge. Go to the Paso Picacho campground page HERE and then click on the ‘Make A Reservation’ button. That will direct you to the ReserveCalifornia site. Once there, search for ‘Cuyamaca Rancho State Park’ and choose ‘Paso Picacho’ campground. It will list all of the campsites and cabins available after you enter a date. Staying there in a couple weeks. It is possible to check in early since it’s off season? Would like to set up camp and do a hike before the sun goes down around 5:00 pm. How do I look at reservations/availability for the Paso Picacho group site? I can’t see it under Paso Picacho campground reservations. How many people can stay at the “group” campsite?